One of President Rody Duterte's most prominent supporter in Europe, blogger Sass Rogando Sasot revealed on social media how biased ABS-CBN on their international news report as she also shared the truth about the protesters outside of the UN Building. In a news repor, ABS-CBN European news bureau chief Danny Buenafe was quoted as saying "Habang isinasagawa ang UPR session sa loob ng UN headquarters, nagdaos naman ng magkahiwalay na rally ang mga PRO at ANTI supporters ng Pangulong Duterte sa labas." 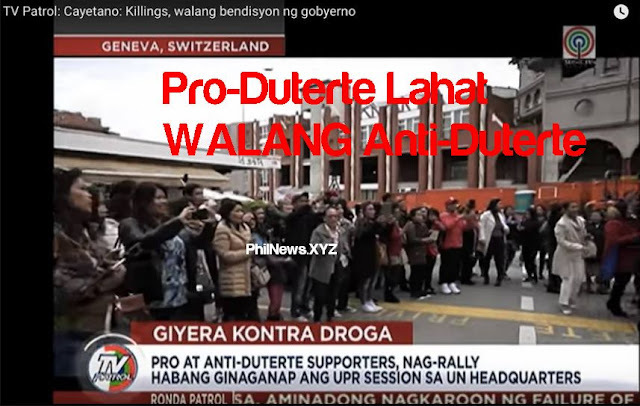 Sass Sasot revealed that there were no Anti-Duterte supporters who were present and holding a rally outside the UN headquarters, the fact is that the footage was taken during the photo ops session of the forum organized by pro-Duterte supporters outside La Baite Restaurant in Geneva. First, this footage is not on May 8. This footage was taken on May 7.